Englischsprachiges Buch über das Mittelalter in England, 1050-1300. To our modern minds, the Middle Ages seem to mix the well-known and familiar with wildly alien concepts and circumstances. The Middle Ages Unlocked provides an introduction to this complex and dynamic period in England. Exploring a wide range of topics from law, religion and education to landscape, art and magic, between the eleventh and early fourteenth century, the structures, institutions and circumstances that form the basis for daily life and society are made accessible. Drawing on their expertise in history and archaeology, Dr Gillian Polack and Dr Katrin Kania look at the tangible aspects of daily life, ranging from the raw materials used for crafts, clothing and jewellery to housing and food, in order to bring the Middle Ages to life. 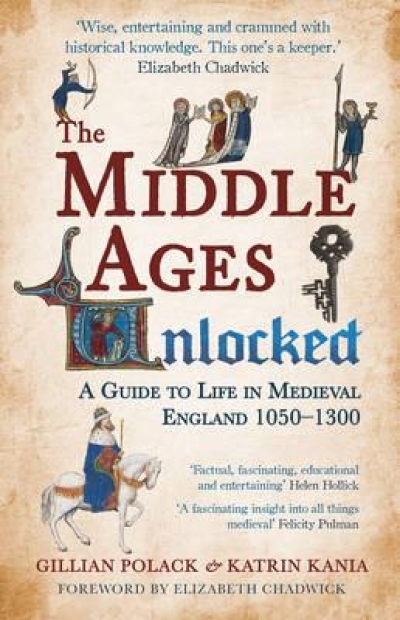 The Middle Ages Unlocked dispels modern assumptions about this period, revealing the complex tapestry of medieval England, its institutions and the people who lived there. Auf Wunsch signiere ich das Buch auch gern, bitte einfach eine entsprechende Bemerkung bei der Bestellung machen!